Discussion in 'OptionNET Explorer' started by Benny, Jun 25, 2017. 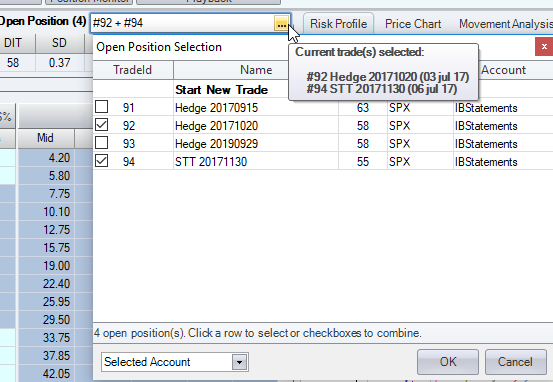 I can't find a way in optionNet explorer to show the combined risk graph of several positions. AFAIK, its not possible currently. Workaround i use is i use a umbrella trade and login my aggregate position in there. Its easier to get started but a pain when making adjustments to individual trades to keep them all in sync. So instead i use it as a snapshot; and maybe after a few more adjustments either reconcile the aggregate position all in one go - or delete and create a new umbrella trade. Thanks for the idea, I'm using a workaround now like you, but then using the export and import function of ONE. In between is a quick&dirty tool to select the positions which needs to be grouped. Still hoping optionnet explorer will add this feature in the future. Can you export trades and import them back after joining them? how do you export the trades? Just the standard one export function. Then a own made program to convert the file to the TOS file format. Then the standard one import function for TOS-files. But, that's not necessary anymore. The latest beta version of optionnetexplorer has support for combining risk graphs. Yes, with the latest public beta version of ONE (v1.28.5 beta), it is possible to merge the risk graph of multiple trades. You can see above that I'm combining the risk graph of an STT with a BSH. It seems like if i move to beta i will have to do that on all my machines and there is no going back if things get messed up. I stopped myself short of pulling the trigger. Have you found a way around it? or just took the leap? Is it stable? also only 8 months or so of backtesting possible it seems. is that right? Yes, you're correct in that you need to move all of your systems over to the beta. This is apparently due to the beta using new backend servers to store the trades. Most of the people in my community jumped into using the beta, including me. The beta has been working fine so far. That's only for futures options. The full version is expected to have much more backtesting data for futures options. For indexes and equity options, you have the usual amount of backtest historical data. Excellent. Pulled the trigger. On beta now. Looks like Beta is using new database. Look at attached pictures. First is my 1.27.40 second is 1.28.5 BETA (taken from Ron's screen-shoot). Not only numbers are slightly different but also whole chain seems to be shifted. What time zone are you in Marcus? It appears that could be the issue as Ron is on the west coast and his numbers match my numbers 15 minutes before the close. I am on the east coast and also use V1.27.40. Marcas, Are both of your examples using the same CEV and Volatility Surface settings under the ONE Configuration Tab? It looks like something is really different with those settings. Paul, I think you are right. That may be it. Neil, CEV setting shouldn't impact prices - just greeks. I believe now it is just time zone issue. I guess I noticed the differences in the Greeks first and looked at my ONE to see what CEV & Volatility Surface did to the Greeks. But the difference in time zones would definitely affect both Greeks and prices. Good catch Paul. It looks like you cannot combine two different instruments even in Beta version. For example ATM structure in RUT and hedge on IWM. That appears to be the case currently...same as for OV. Would have been nice to mirror the capabilities of TOS in this regard, maybe in later versions.